There is a point in most films where the viewer recognizes the patterns they are seeing in the story they are watching are familiar and well-worn. This happens early on in Mama. The difference, with this and other films produced by Del Toro, is that we always see such inventive ways of arriving at the chilling moments, we often don’t care that we have a good idea what is coming next. By the end of this tale, I realized I was viewing a more sensible version of the Woman in Black. That film, not nearly as likable as this one, even if they both have brave twists at the end. 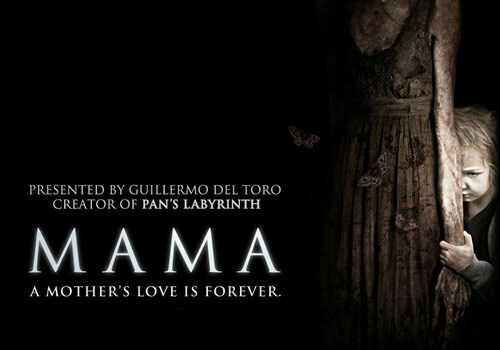 Mama begins with a husband and father gone off the deep end. The wife is vanquished and the children are about to be, when something unexpected happens. The girls, aged 3 and 1, disappear for 5 years. The twin brother of the crazed father, pays searchers who find them in a seemingly abandoned house. The girls have developed their own language and act quite like animals. The older one still has enough of a connection and vocabulary that a doctor (Kash) makes a breakthrough. We discover that the girls talk of a protector, whom they call Mama, that raised and cared for them the whole time. Plot dictates that the doctor ignore some of these discoveries, placing the children in the care of the Uncle Lucas (Coster-Waldau) and his rocker girlfriend, Annabel (Chastain). Lucas and Annabel are artistically busy, which means they have time to pursue their muse. The boyfriend convinces Annabel to drop the rocking and go with the mothering thing. That Annabel never truly commits actually helps keep her around as the story develops around her. Chastain is given a horrible look and what could have been a ridiculous character, but she truly makes the character work. There is a delicate balance between stubborn and laboriously dense, and she charges along that line. When Victoria, the older of the two, warns her not to open her closet door. She just doesn’t. And she leaves the kids in the room. It’s a bold move that works well. Muschietti excels with his lead at pacing. The film has a lot going for it in the first 2/3, predicated by well-timed reveals and information that is accepted smartly. This all breaks down in the last act, when the discoveries rely on thinner strands of common sense. This is only partially redeemed by a surprise end that thankfully does not involve the false ending. The result will make you feel slightly taken advantage of, but entertained, no less.